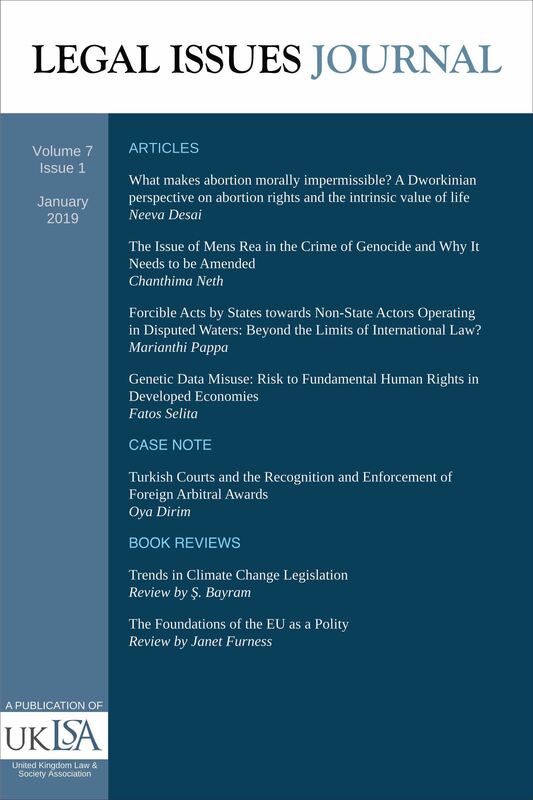 Legal Issues Journal is an interdisciplinary journal publishing original research on all legal issues affecting society, including: law and genetics / biosciences; law and justice; law and philosophy; law and medicine; law and business; and law and equality. LIJ publishes original papers, case comments, short reports, debates and book reviews. The Journal also provides important news and interpretation on changes in the legal world and coming trends affecting law, lawyers, and society. Contribution to society, nationally and internationally, is the focus of LIJ. LIJ uses double-blind peer review process – both the reviewer(s) and the author(s) are anonymous. What makes abortion morally impermissible? A Dworkinian perspective on abortion rights and the intrinsic value of life. Forcible Acts by States towards Non-State Actors Operating in Disputed Waters: Beyond the Limits of International Law?